BEA and SID Display Week are both kicking off today with breaking news and fascinating sessions, but that's not all that's happening today. Viewsonic has just unveiled their latest wireless monitor at Computex in Taiwan. 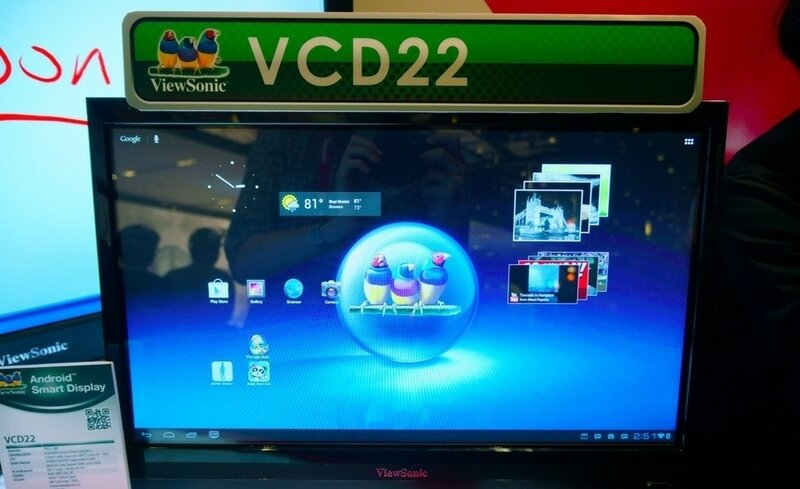 When it's not a wireless monitor the Smart Display VCC22 is a 22" Android tablet running 4.0 ICS on a 1GHz dual core CPU. There's no details yet on the screen resolution, but The Verge is reporting that it supports 1080p video. It also has 1GB of Ram and a suite of apps that suggest it might be targeted at the home market. That's good because this thing is heavy enough that I doubt you'd want to carry it around. This tablet in particular caught my eye because it revives an old market niche that ViewSonic developed decade ago and then abandoned, and I find it interesting that the market has come full circle. In 2003 ViewSonic released the Viewpad 100, a 10" tablet running Windows CE on a 206MHz ARM CPU. While it technically was a tablet, it lacked Wifi, which wasn't nearly as widely supported then as it is now. I still have the first wireless monitor that ViewSonic released in 2003; like the VCC 22 it runs a mobile OS (Windows CE 3.0) and it had decent resolution, CPU specs, and other features for the day. The Viewpad 100 was my first tablet back in 2008. The later models were viable mobile devices as late as 2009, thanks to the drop in price after the line was discontinued. It was also rather expensive, with a retail of over $1,000 when initially released. That is an issue the VCC 22 will share; at an estimated retail of $470 it costs more than other Android tablets. Given that 10" tablets can likely run the same remote monitor apps that the VCC 22 requires, that could hinder its success. The VCC 22 is also going to be rather heavy, and that too will turn some users off.